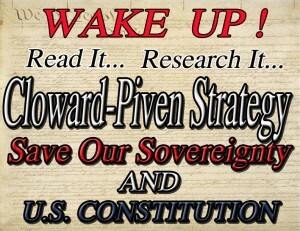 The Cloward-Piven Strategy (CPS), Saul Alinsky and the concept of clergy as undercover intelligence officers were introduced in Part One. What follows is from a former colleague drawing from his experiences in the 1970’s to explain how CPS was employed to create a national “crisis” setting the table to radicalize the national government. Believe it or not these decades old events, told below by an Intelligence Officer with the code name The Rev. Big Goon, help explain our present political and economic crisis. I’ve been doing some thinking that I thought I would share with you. My memories of the work I was doing when we knew each other at UMKC (University of Missouri at Kansas City) have really helped inform me about our present situation with our current President and the financial crisis. I have visited “The Steady Drip” many times and I know your reputation for accurate research, so you will find citations included to back up what I have to say. I noticed that on your blog you have expressed suspicions about the onset of the financial meltdown just in time to help Obama get elected. You also expressed suspicions about the most liberal President and Congress in the history of the nation conveniently coming into office at a time when the economy was so wounded that it might be possible to establish a socialist economic system. Just how “lucky” can these liberals get? What I have to say may help you understand the dynamics, but I doubt it will do away with your suspicions. Being suspicious is a job requirement for both Clergy and Intelligence work. I also know you are well connected to the Internet community and influential bloggers, so you have my permission to use my comments as you see fit. The summer of 1970 in Kansas City was a really wild ride. In 1970 alone, an estimated 3,000 bombings and 50,000 bomb threats occurred in the United States, and Kansas City was not left out of the chaos. One of my assignments was to look into the activities of a group of radicals who, after they were arrested, became melodramatically known as “the Kansas City Four.” They were really bungling, small time radicals. A legal case from those days survives on the Internet. I began the process of establishing my cover. It was arranged for the FBI to contact known radicals in the community and ask them questions about me. My “case officer” posed as a state employee, so my monthly meetings at his office were open and aroused no suspicion. I was warmly accepted by the radical community, and even spent some time living at a place operated by young radicals called the Ecstatic Umbrella, until I found more permanent housing. The Second Presbyterian Church at 52nd and Oak owned an apartment building, and one of the Kansas City bombers lived in that building. As well as doing my job as a campus chaplain, I became a youth pastor at Second Presbyterian, and took an apartment in their building. I must admit that I was very uncomfortable living in the same building with a LSD using, grass smoking alcoholic who I knew was making bombs in his bedroom. By the time I entered UMKC in the fall as a graduate student, my cover was already firmly established. To put a cinch knot on my cover story, I also became the Chaplain of the Vietnam Veterans Against the War. I still experience a gratifying chuckle over how perfectly, easily, and quickly I had infiltrated the radical community in KC. It wasn’t that hard. Almost everyone was doing acid and grass. Every weekend there was a wild carnival of hippy, stoner, radical, love-child young people in Volker Park. Contact was easy. I won my status in the counter-culture community with nothing more than a prank. I purchased a case of dish washing liquid, and in the dark of night I poured the entire case into the Plaza fountain. My accomplices were very impressed. My boldness and mountain of suds made the front page of the Kansas City Star. I had a different name then. I was called Rev. Big Goon. It should be noted here that I physically resemble a great silver back gorilla, although my knuckles don’t drag on the ground. A local Kansas City undercover officer who had no idea who I was gave me that name. I saw it in a police report on activity in Volker Park. Years later I found out that my cover was so believable that I was on a list of dangerous radicals that Kansas City Chief of Police Clarence Kelley took with him when he was appointed as the Director of the FBI in 1973. For me, the investigation of the Kansas City Four quickly fizzled. Other investigators uncovered the activities of the suspects, provided the evidence and they were arraigned in July of 1971. My last contact with that case was to arrange to be appointed as a Chaplain for the Jackson County jail, where I interviewed one of the suspects who was being held there as a federal prisoner awaiting trial. The case was hugely overblown, in the way law enforcement and prosecutors will exaggerate to make their work seem to be more important and to advance their careers. One of them was more of a nut case than a criminal and he might have been the most dangerous because of his hatred and violence against “the system.” He is still alive, on the streets, and probably still dangerous. I struck up a romantic involvement with a social worker from Chicago who was working for Family and Children’s Services, a state of Missouri agency. Her friends and contacts were a gold mine for my new mission. 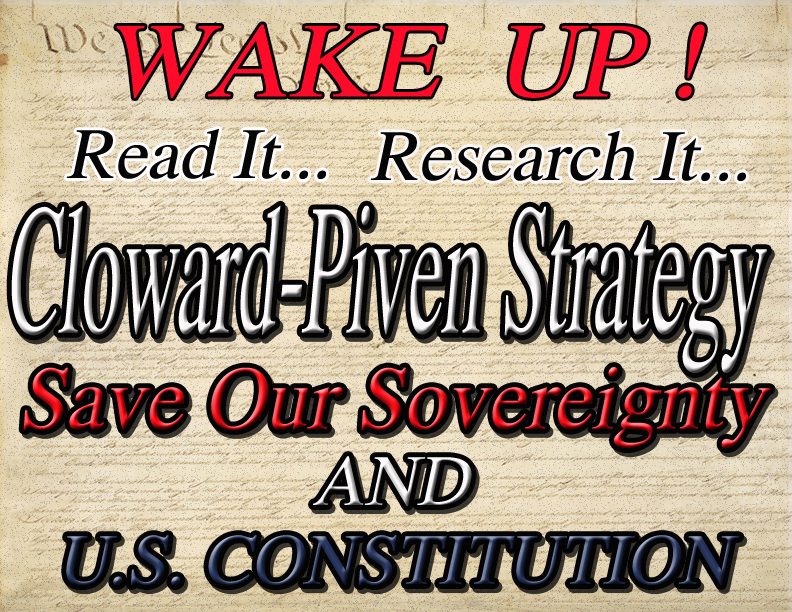 That is how I became involved with the Welfare Rights Organization (WRO) of Kansas City where I saw, first hand, how community activists applied the CPS (Cloward Piven Strategy) theory in real life. CPS and Saul Alinsky were all the rage among left wing professors, activists, students and social workers. My social worker girl friend from Chicago knew all about Saul Alinsky. CPS was a new idea seen as dazzlingly brilliant by social workers and other liberals. She introduced me to a radical community activist, also from Chicago, who was organizing poor black people who lived in Wayne Minor public housing. His name was Mark. Mark was also a clergyman. Mark introduced me to a powerfully charismatic black woman who was Executive Director of the Kansas City Welfare Rights Organization. There were several young leftist white men and women who worked for the WRO. Mark taught me the ropes about how we were going to train these young “community organizers” and welfare recipients, so that they became effective foot soldiers for the left wing. Mark and I were part of the “cadres of aggressive organizers.” We would go through the vast, dilapidated cavern of poverty called Wayne Miner with a list of all the entitlements offered by the Federal Government and the State of Missouri. Each person we talked to became instantly “motivated” to apply for more welfare benefits. Before long, people began seeking us out at the WRO office. Outreach to the community wasn’t necessary. The community flocked to us. We would show them how to fill out application forms, and many times we filled out the forms for them. When we had a large number of people ready to apply for new benefits, or additional benefits they had not known they were entitled to before our training, we arranged for busses to take our new recruits to the state office building. We had spent many hours training them as to what to do and what not to do. We told them it was ok to be loud, obnoxious, aggressive, but to never be physical or damage property. In other words, do everything you can do to be uncivil, but don’t get yourself arrested. We planned the event for a Friday and, of course, we called the media. Our “trainees” staged a class “A” media event for the television cameras. Our first “action” was a rousing success. When we got to the WRO office Monday morning there were hundreds of people waiting to be “trained” in how to collect welfare. The part of the welfare system to feel the most heat right away was what the state called “intake.” Intake social workers were overwhelmed, intimidated, and routinely approved questionable benefits because of the stress they were experiencing. The state began a panicky search for new intake workers, and anybody with a BA degree was practically dragged off the street. Larger office space was arranged for the intake department. Mark and I were heroes to the radical community. Since this was happening at the same time in St. Louis and other cities, Kitt Bond, then Auditor of State of Missouri, and soon-to-become Governor, asked for help. I was assigned by my “handler” to clandestinely brief Bond’s representative about what was behind the welfare revolt. As it turns out Mark, the community organizer from Chicago, and my social worker girl friend from Chicago were also friends with the Kansas City Four. Soon my primary mission was accomplished, and I went on to other projects, but I never forgot the effectiveness of creating a crisis to bring about radical change. 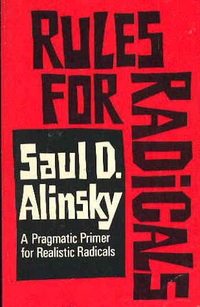 I concluded that the WRO and the Alinsky/CPS inspired radical community organizers were more of a danger to the nation than the inept small time bombers. It wouldn’t take a degree in economics to see what was going to happen. This time the Alinsky/CPS pressure wasn’t aimed at the state of Missouri and Kitt Bond. By 1999 Fannie Mae came under pressure from the Clinton administration to expand mortgage loans to low and moderate income borrowers. At the same time, institutions in the primary mortgage market pressed Fannie Mae to ease credit requirements on the mortgages it was willing to purchase, enabling them to make loans to sub-prime borrowers at interest rates higher than conventional loans. Everybody knows how the problem escalated from there. Do you still have doubts about your suspicions that the financial crisis happened just in time to help Obama get elected? Do you still have doubts about your suspicions that there is something fishy about the financial crisis and the way Congress passed the trillion dollar “Reward Liberal Causes and Constituents Bill” without anyone actually reading it, because we had a “crisis”? See I told you that I wouldn’t be able to help your suspicious nature.